All of the body’s organs rely on sufficient levels of vitamins to work properly, and the brain is no exception. The fact that stress causes the body to burn through nutrients more quickly than usual puts depressed individuals at far greater risk of suffering vitamin deficiencies. Eating nutrient-dense foods and taking vitamin supplements frequently prevents and treats these cases of depression, but some vitamins play greater roles than others in mood. According to many studies, people who are depressed frequently suffer from vitamin D deficiency. Those with seasonal affective disorder are the most likely to have low levels of this vitamin as a result of spending more time indoors during the winter months. Vitamin D is essential for many critical processes in the body. Along with lower serotonin, lack of vitamin D also contributes to cognitive problems in older adults, suggesting it plays a very important role in brain health. B6 is required for the body to manufacture the neurotransmitters serotonin and dopamine from l-tryptophan and l-tyrosine, respectively. People deficient in vitamin B6, which is critical to brain health, are well-known to suffer from a wide variety of neurological problems, including depression and irritability. Certain substances and conditions, such as theophylline in coffee and tea and birth control drugs, make B6 deficiency more likely. Supplements should not be taken in excess because high levels of B6 can cause permanent nerve damage. A deficiency of this vitamin causes symptoms associated with depression such as brain fog and sluggishness. Although some studies have found B12 to have no effect on mood, others such as a study performed in Finland in 2003, found B12 to have big benefits in helping patients overcome depression. Besides being essential for normal energy and appetite, B12 is involved in the synthesis of SAMe, a molecule involved in the metabolism of serotonin, dopamine, and norepinephrine, which are all involved in mood support. Like many antioxidants, vitamin C is used much more quickly when the body and mind are under stress. One of the first symptoms of vitamin C deficiency is a host of mental problems including depression and anxiety. As it progresses, psychosis, delirium, and other problems eventually develop. Vitamin C is critical for the production of neurotransmitters norepinephrine and serotonin and the hormone testosterone. Without sufficient levels of vitamin C present, GABA receptors don’t work properly, which results in anxiety and depression because GABA inhibits transmission of nerve impulses during stress. Vitamin B3, or niacin, has been called miraculous by many people who take large doses to combat a wide variety of psychiatric disorders including depression, anxiety, schizophrenia, and addiction. The medical name for niacin deficiency is pellagra, and its symptoms include severe depression and psychosis. Stress and alcohol consumption cause depletion of B3 over time. Supplementing with nicotinic acid works well for depression, anxiety, and other mental health conditions, but the time-release versions that don’t cause flushing are known to cause liver problems and should not be used long-term. Better known as folic acid, B9 is required by the body for the synthesis of serotonin, dopamine, and norepinephrine. A 2007 research study, conducted at University of York and Hull York Medical School, proved that a gene was common among depressed individuals that prevents them from being able to process folate properly. Other studies involving female and elderly patients found that folic acid was just as effective as antidepressants at fighting depression. Patients should consult a doctor before supplementing with folic acid because it can interact with a number common medications, such as birth control pills. Vitamin A is required for the body to produce dopamine and maintain dopamine receptors and also supports healthy testosterone levels. Both are major components in normal levels of pleasure and motivation. Although many people think of beta carotene as the quintessential source of vitamin A, most people are unable to convert it well enough to experience significant benefit. Instead, those interested in supplementing vitamin A may want to try cod liver oil, which contains plenty of vitamins A and D.
Usually called thiamine, deficiency results in a plethora of cognitive problems, including depression and irritability. Studies have shown that depressed patients admitted to mental hospitals are frequently low in thiamine. Thiamine deficiency impairs the function of serotonin in the brain, and animal studies have found that supplementing the vitamin in deficient animals returns serotonin function to normal. People supplementing with thiamine may also want to consider taking magnesium because it converts B1 to its active form. Evidence of the importance of omega 3 in mood disorders continues to grow. One study of fish oil’s benefits to bipolar patients found fish oil so effective that researchers stopped the study early so the patients receiving the placebo could start taking fish oil right away. Omega-3 fatty acids have been found to support serotonin and dopamine synthesis, stabilize mood, and prevent psychosis . Fish oil is far more effective than flax oil as a supplement because most people are unable to turn the ALA in flax into DHA, the usable form found in fish oil. Many studies have shown that individuals taking vitamins are less likely to become depressed, and that supplementation helps many to recover from depression. Other studies have found little or no benefit in depression, but questions remain regarding who paid for the studies, what forms of vitamins were used, and how symptoms were measured before and after supplementation. With the evidence suggesting vitamins play a significant role in prevention and relief of depression, many patients could benefit from trying vitamin supplements as a low-cost, low-risk form of depression treatment therapy. In some cases, however, patients may suffer ill effects or no benefit, so they may wish to consult a physician before starting a vitamin regimen. Patients suffering from severe depression or whose symptoms don’t improve from taking vitamins should contact a doctor immediately. With stress and poor diets so common today, it’s little wonder that so many people are depressed. 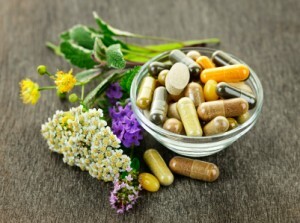 Many patients suffer from the serious side effects of conventional psychiatric medications, so vitamins are frequently a welcome natural therapy that gives gentle relief from depression and some people prefer over commonly prescribed antidepressants. Vitamins support the healthy functioning of the mind and body as a whole so long-term healing can occur.